In the panel on "Ecologies in Crisis: Transferring, Converting and Marketing Value in Unstable Times" with discussant Rosa Akbari of the International Rescue Committee stories of crisis and resilience turned out to encompass a wide variety of political and natural disasters. As Akbari noted, when it comes to understanding creative responses to precarity in developing economies from the position of the developed world, "we have a lot more to learn from them." The first presentation on "Managing, negotiating, and converting 'currency' in daily life in a multicurrency environment of Zimbabwe" by Innocent Tonderai Mahiya of Women's University in Africa and Simbarashe Gukurume of the University of Cape Town grappled with the effects of a "serious economic crisis," where "the worst inflation in the world for a country not at war" had created a country of "poor billionaires," where daily 50 thousand withdrawal limits cripples those earning salaries of 50 billion units in local currency. The research team provided an overview of money providers. EcoCash, the most widely used mobile money service in the country, launched in 2011. It was subsequently joined by NetOne, which introduced the government-controlled OneWallet in 2013. With Telecash, which is now the second-largest provider in the country, there are three giant telecommunication companies joined by other stakeholders and players in a growth environment in which the largest companies have over six million subscribers. Thus this national mobile money environment could be compared in scale to the territories of the M-PESA model, which the research team attributed to the rapid introduction of mobile money services, which rapidly expanded in urban and rural areas. Additionally mobile networks are seen as reliable by informants with an increased number of players in mobile money sectors. Access is added by ubiquitous advertising including omnibuses and commercials on government radio and television. The team's field site in Chivi was one of first areas to adopt foreign currency because of immigration flows creating a sending population to the community. With so many from Chivi migrating to South Africa, there were formal and informal channels for currency alternatives long before the government adopted the multi-currency system, particularly with the circulation of the rand. The team's methodology was primarily qualitative, based on ethnographic participant observation with interviews with clients and agents of mobile money services and informal conversations with villagers. In addition to the rand, the US dollar was a common currency, but there was also the presence of the Chinese yuan. Researchers were interested in the process which is negotiated during the exchange and features that include high social solidarity and the deployment of social capital. Sometimes this involved the subverting of regulatory restrictions, as when elderly clients would sometimes send grandchildren to negotiate on their behalf or attempt transactions without documents by deploying social understanding mechanisms. They also considered types of mobile money agents and the politics of space, because some operate in makeshift booths, while others are run out of shops. "Financial Security: Laborers’ Transfer of Value from Karachi’s Marketplaces to Tribal War Zones in Pakistan" by Noman Baig of Habib University Pakhtun offered the perspectives of many participants living in contested territories under threat of drone strikes. The three major perspectives were those of impoverished laborers, state officials, and actors with a corporate point of view This research explored "the value transfer system of ethnic Pakhtun migrants working on daily wages in Karachi’s marketplaces." Baig chose to tackle the following research questions: "How do laborers transfer value from the city of Karachi to villages and tribal areas of Pakistan?" "How does state counter-terrorist surveillance impact laborers’ traditional value transfer system?" and "How are emerging financial technologies such as branchless banking shaping customary ways of handling money in Karachi’s marketplace?" Baig aspired to the ideals of the "good anthropologist" by attending to "their interactions with financial instruments such as branchless banking" and borrowing and credit practices "within their kinship, religious, and ethnic networks." His methodology emphasized a "deep hanging out with the laboring class" that was enhanced with semi-structured interviews. He drew on many sources of information for his study to understand the experiences of his core group of laborers and migrants, including retail agents, Easypaisa staff, State Bank of Pakistan representatives, employees of the Habib Metropolitan Bank, currency dealers, and money lenders. 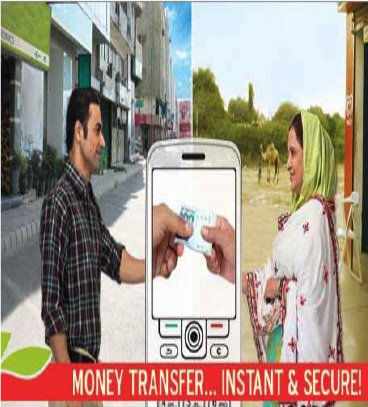 Easypaisa is emerging financial instrument with 250,000 retail agencies and 22 franchises in Karachi. It only takes two days to get a franchise, although it used to take 15 days. The major requirement is to have to have a physical roof, so agents are not just sitting on a sidewalk. Such mobile financial services facilitate dramatic changes around existing community bonds, which could also create disruptions in an already disrupted environment. The use of digital financial instruments might seem to offer relative autonomy, Baig argued, but that autonomy could also risk greater precocity. A person becomes "more vulnerable to economic crisis" but is "also released from embedded networks of kinship." These changes also encompass changing gender dynamics and disrupt existing systems of home delivery through kinship. This disintermediation might be appealing when "laborers hesitate to visit banks" that are too "fancy and glittery." In place of banks, retail agents offer banking services to the underprivileged, but laborers’ income gets incorporated into financial logics far beyond Karachi. "So they become included but they stay excluded." In other words, "financial inclusion and physical exclusion happens simultaneously," because "financial categorization reproduces social hierarchies" in the "network paradox of capitalism" that "allows you in but excludes you also." Baig insists that such people aren't really "unbanked" but they are banked "in their own ways." He cautioned that regulation of Hawala by the state plays a significant role as existing networks are "demonized" and the "alternate of corporate technologies" is lauded. He explained that Western Union "became popular after 9/11," because the informal system was seen as illegal, but "profit comes to Wall Street." In his view of the "financial ecology" he is interested in "how a laborer in bazaar in Karachi is connected" to the U.S. sector. He also expressed his concerns that "the discourse of financial inclusion gives a negative valuation to everyday forms of money management" particularly "under the rubric of security and counter-terrorism." According to the presenter, "Strange Intersections: Humans, Technology and Disaster in a Himalayan Valley (Nepal)" by Kabir Mansingh Heimsath of Lewis & Clark College could just as easily be retitled "strange disjunctions." 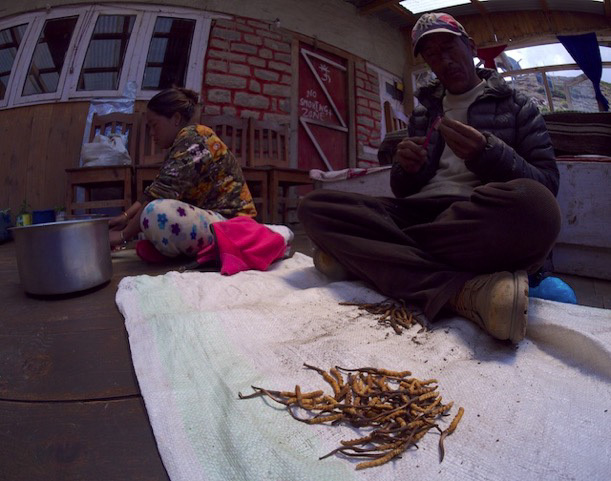 The commodity Heimsath focused upon in his IMTFI research is an unusual one: the caterpillar fungus yarta. He explained how his interest in "the experience of space and place" shaped a relatively "new project on South side of the Himalayas." Although he hasn't "done focused fieldwork yet," the research questions began to emerge in late June 2013 from a conversation in back of vehicle going to Manang. He described interacting with a "spotlessly dressed" man "just as monsoons were beginning." When he glanced down at the man's baggage, the man explained that he was going up to a remote region to sell caterpillar fungus, because he was told prices were higher in a remote valley than up in metropole. Heimsath puzzled over the "weird commodity chain" of "taking something out and bringing it back again." He described how Manang was culturally Tibetan but part of Nepal with a history of trade and smuggling. Because of a large exodus to Katmandu, the region had "huge ostentatious houses based on money they made with international trade," as well as financial streams from trekking tourism and yartsa. He characterized the area as "cosmopolitan for decades," because Yartsa was already comparable to the price of gold and"almost anyone can pick it." He described himself as working "in the footsteps of Anna Tsing whose 2009 article on mushroom foragers was formative for his work. He also credited the ideas of Tim Ingold on space and place as helpful for not conceptualizing them as an "empty passive category" containing place. He noted his own "preference in thinking about pathways and movements," so that space was"always coming into being through pathways, movements. This product of "summer grass" and "winter worms" grows in human influenced landscapes and yak pathways. Foragers never sell directly to the international market, because there are several levels of middlemen. "Exporters aren't even on map," because there are smugglers as well as buyers and exporters. Yarta is used primarily as gift item among elites like Tsing's mushroom mappings. In considering the overlap with tourist networks, he asked if it an intersection or lanes on the highway. He aspires to do a "similar mapping for road the itself," because in Nepal half of all roads have been built in last decade in response to a "teleological development paradigm" in which "we build the road, and everything else will be fine." As he exclaimed, "these networks existed before the road got there, and the money was there before the road, so why do we need the road?" )He pointed out that hydropower was also as paradigmatic development project.) His planned research would look at how the earthquake has effected all of this. In the question and answer session, participants developed the theme of "following the money" and the dynamics of inclusion and exclusion in a group largely skeptical of the development paradigm.